The Energy Managers Association (EMA) corporate Patronage opportunities are open to a selected number of organisations that have relevance to energy management and to professionals working within this sector. The Patronage opportunities are effective ways to invest in the future of your business and to gain the profile that your organisation deserves. EMA Corporate Patron is the opportunity to align with the UK’s leading association serving the energy management community and to network with the EMA membership. A Patron will become recognised as an organisation supporting sound energy management and as a knowledgeable resource for the community; for an investment of £9,000p.a. 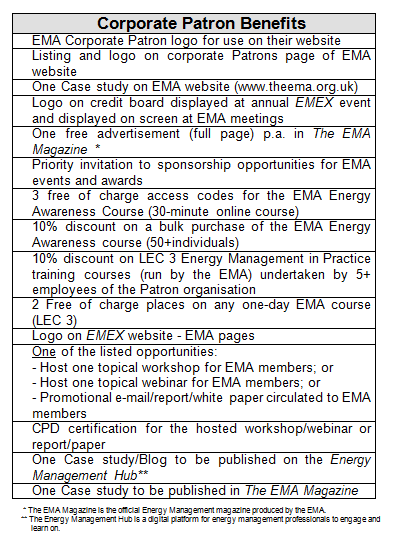 Become EMA Corporate Patron. Contact the EMA on 0203 1762834.